Crazy Typhoon Coin Pusher is a single-player as a fantasy skill test medal game from Namco and comes with a large whirlpool funnel and with carnival game style. 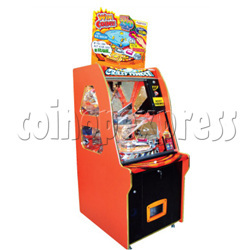 Player inserts coins into the machine with good timing, when the coin spined around the Crazy Typhoon's funnel in a bid to land on one of the game's winning zones, or, best of all, player reward with related coin / ticket. Players can rapid-fire coins in to increase their chances.